Produced by CBC's "The Nature of Things"
ONE OCEAN tells the story of the world's vast interconnected ocean ecosystem. With a wealth of never-before-seen HD footage, the spectacular 4-part series bears witness to underwater volcanoes erupting meters from the camera and discoveries of rare and bizarre life forms. Some of the planet's most innovative and charismatic marine scientists guide us on this adventure. Journey with ONE OCEAN's cameras as they travel to Canada, Australia, New Zealand, Africa, the Middle East, Europe and the USA exploring the richness of the underwater world. In each breathtaking episode, join scientists as they explore the ocean's beauty, power and fragility. The scientists include marine biologist, Boris Worm; ocean climate modeller, Debbie Ianson; zoologist, Nancy Rabalais; geologist, Nick Eyles; oceanographer, Richard Feely; paleontologist, Ted Daeschler; extreme deep sea researcher, Verena Tunnicliffe; and author and underwater photographer, Wade Doak. The series is accompanied by an award-winning educational website, One Ocean Interactive, that contains a vast amount of information to engage the curious student. Birth of an Ocean - The story of the ocean's turbulent beginnings and its successive incarnations. Footprints in the Sand - Reveals the devastating impact of human activity on the ocean since we first settled along its coasts over 150,000 years ago. Mysteries of the Deep - Explores the beguiling depths of the seas, as technology allows us to venture further and further into the planet's last frontier. The Changing Sea - Decodes the signals that the ocean is sending us. Is the ocean's chemistry being compromised by increased acidity, less oxygen and warming temperatures? "Very impressive! 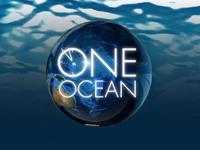 One Ocean is an exceptional series of videos focused on some of the most pressing problems threatening the health and future of the oceans...The geographic diversity of the areas covered, the superb quality and high definition videos, and the lucid explanations of the science provide a powerful and credible set of stories...These are moving and compelling stories of ocean researchers investigating the problems humans have created in the sea and explaining why our one ocean needs our help now." "I have finally found a film series that thoroughly covers all of the current marine topics that I teach in the classroom which includes MPAs, marine ecosystems, sustainability, international coastal culture, climate change and the formation of ocean life. It is presented in a sense of urgency and at the same time provides essential background information peaking the viewer's interest with animations and interviews with seasoned marine scientists and beautiful cinematography! One Ocean should be an integral part of any environmental studies course." "Puts viewers in the passenger seat along-side scientists, fishermen and explorers on numerous ocean-going expeditions...Most impressive is the ample footage from deep-sea explorations--courtesy of research submersibles. These give us a window into alien worlds...Appropriate for audiences from grade school students to adults." "There are a lot of DVDs available on topics relating to the ocean, but these are some of the best I have seen. I enjoyed the way in which information was conveyed and was pleased to learn things I had not seen in previous videos...I highly recommend this series to public, high-school, and college libraries." "The cinematography is breathtaking. The views, especially those of the oceans' depths, are nothing short of brilliant. [Birth of an Ocean] is both visually stimulating and content rich, allowing for a quite wide and varied audience access to this DVD. Both teachers and students, along with every other person simply interested in the nature of the oceans and our ecosystem, will find themselves very pleased with this DVD." "Spectacular undersea footage, informative narration by David Suzuki, and engaging interviews with leading marine conservation scientists worldwide. Footprints in the Sand presents case studies of major threats to our oceans caused by human activities. Topics spanning the globe include overfishing and coastal pollution, and importantly, ecosystem-based approaches for replenishing and conserving the oceans for future generations." "If there is a rhythm to the stories of ecosystem crises from the ocean and lands around the world, Footprints on the Sand adds several new beats...Footprints uses beautiful imagery layered with interviews and testimony from fishermen and scientists on the front lines of each story. It concludes with two stories of hope that show people can come together to create protected areas that support resilience in coastal ecosystems." "Footprints in the Sand illustrates the effects of fishing in artisanal and industrial fisheries and makes strong visual connections among the `fishing down' process, the effects of man and burgeoning human populations on the world's oceans...I will use it to generate a discussion of fishing as a major negative influence on marine ecosystems that is under-appreciated and has preceded other impacts including habitat destruction, pollution, water diversions, and the introduction of exotic species." "Very impressive. The footage is exceptional and the subjects that formed the sub-themes are good choices. Mysteries of the Deep exhibited a good balance between applied, fishery-related topics such as the crash of the orange roughy fishery and the effects of bottom trawling on the deep corals habitat, and new basic research such as the feeding strategy of the barreleye fish, Macropinna microstoma, and the work on the Mariana Arc. Excellent." "The Changing Sea presents fascinating case studies of the looming threats of the evil twins of ocean warming and acidification...Ocean warming is already disrupting ocean ecosystems. Also caused by carbon emissions, ocean acidification [is] a global problem that will worsen unless society finally addresses the dangers of unlimited burning of fossil fuels and forests."